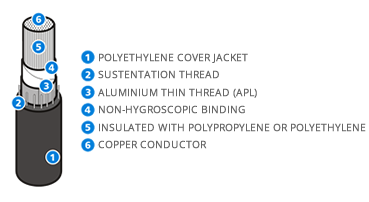 Fabrication: Electrolytic copper conductors, insulated with Polyethylene jacket, protected in group by APL cover jacket. In all perimeter long, synthetic threads are incorporated to provide sustentation and high resistance to axial high-tension.. Put into practice: Indicated to aerial electrical grid.